Apple has taken out 4 of the top 5 places for smartphone shipments in Q1, 2018, according to Strategy Analytics. Xiaomi took out fifth place with its Redmi 5A, while the Samsung Galaxy S9 Plus took out the number 6 spot, which is a decent showing given it launched late in the quarter. Overall, the total smartphone market contracted slightly for the same period last year. In a strong result, Apple's iPhone X took out the top spot with 16 million sales. However, this was well down on the 21.5 million sales recorded the iPhone 7 for the same period last year. For a massively hyped device (the company's 10th Anniversary model and its first all-new design in three years), it had been expected to kick-start an upgrade supercycle. That clearly didn't happen, even if it is unquestionably a hit. The Strategy Analytics data seems to underscore Apple CEO Tim Cook's recent remarks that the iPhone X is a "Super Bowl winner," even if "you wanted it to win by a few more points." 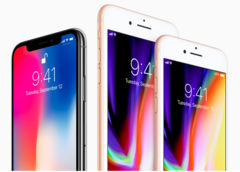 Undoubtedly, its sky-high US$999 starting price did scare off customers who likely opted for the iPhone 8 and 8 Plus, driving strong sales of those models. The one-year-old iPhone 7 still sold remarkably well with 5.3 million sales for the quarter. Xiaomi's results point to its rising star status on the global smartphone stage, and reflects recent data from IDC that puts in fourth place overall for total smartphone shipments. Its Redmi 5A shipped over 5.4 million units during the quarter, which makes it one of the best selling devices in its history. Samsung's Galaxy S9 and S9 Plus models have been selling well since they debuted in March, but this only gave them a toehold in the Q1, 2018 sales data. The Q2 results from Strategy Analytics will be interesting, as it will reveal how the S9 range is stacking up to iPhone X sales on a more even footing.